Sources close to Toyota have confirmed that the next-generation Corolla will be launched in 2020. We’re expecting the Japanese manufacturer to showcase the sedan at the 2020 Auto Expo and launch it soon after. Based on a new platform, the Corolla is longer and wider. With a drop in height and a sharper design, it looks sportier than ever before. On the inside, there are plenty of features to be excited about, including a sunroof, leather upholstery, climate control and a touchscreen infotainment system. Toyota is unlikely to offer a diesel engine with the new Corolla. Either a 170PS 2.0-litre petrol or a 122PS 1.8-litre petrol-hybrid is expected to be on offer. 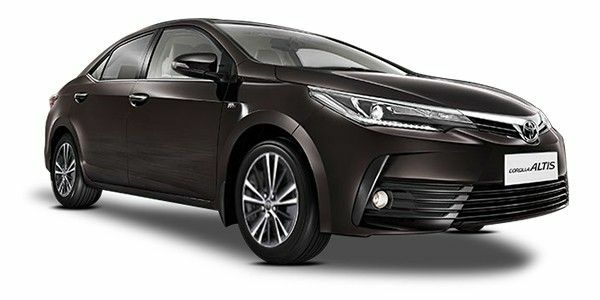 Toyota Corolla Altis prices start at Rs. 16.45 lakh for petrol and goes upto Rs. 20.19 lakh. The prices of Corolla Altis diesel variants start at Rs. 17.71 lakh and the top-end diesel is priced at Rs. 19.36 lakh. Toyota Corolla Altis is available in 6 variants and 7 colours. Share your experiences with Corolla Altis? The claimed ARAI mileage for the Toyota Corolla Altis petrol is 14 kmpl, and for the Toyota Corolla Altis diesel is 21 kmpl. Q. When did it first launch in India? The first Toyota Corolla Altis had launched in mid-2001 in India and it got its last facelift in March 2017. Q. I am looking for a sedan car which gives comfort on rear seat and good performance engine. Does Corolla Altis meet my need? Q. Is it worth to go for Corolla Altis or Civic diesel? Q. Hundai Elantra or Toyota Corolla Altis, Which one would you recommend in terms of safety, mileage and features. Q. Does any variant offers sunroof? No, Toyota Corolla Altis isn't equipped with Sun-Roof. Top of the range offers sunroof and cruise control. An Alternate lifestyle is what Toyota is giving the Corolla Altis with not only a facelift, but also a new gearbox and more horsepower from the petrol engine. The car's shelf life just got extended, and here's how! The bold new Toyota Corolla Altis is geared up to turn around the dwindling sales of the D-segment. The Toyota Corolla is one of the most popular cars in the world, and in India, the story is no different. When the second gen Altis was launched in India, it caused quite a stir in the market and reclaimed the coveted status that had been slipping from its grasp. The facelift was launched just last year and the Corolla Altis is currently priced between Rs 15.7 and Rs 19.64 lakh, ex-showroom Delhi. The front features a ‘T’ design theme and swept back headlamps which now get Bi-beam LED lighting system along with smart LED daytime running lights on the top-end variants. The grille is narrower compared to the pre-facelift car but the long and wide bonnet and the almost sportscar-like profile are still intact. The sharp character lines, muscular proportions along with shorter front and rear overhangs give the Toyota Corolla Altis an aggressive stance. The car runs on 15-inch or 16-inch wheels depending on the variant, and comes with good looking alloy wheels. Inside, there’s liberal use of leather and soft-touch materials on the dashboard. And the Altis gets the lighter 'Flaxen' colour scheme and round air-conditioning vents. Features include a 10-way adjustable powered driver's seat, rear sunshades and a reclining rear bench. Infotainment duties are handled by a 7.0-inch touchscreen unit paired with six speakers. The head unit does feature MirrorLink but there's no Android Auto or Apple CarPlay on offer. The Toyota Corolla Altis comes with a choice of two engines: a petrol and a diesel. The petrol motor displaces 1.8 litres and makes 140PS of max power and 173Nm of peak torque whereas the diesel makes 88PS of max power and 205Nm of peak torque. The petrol can be had with either a 6-speed manual or a CVT gearbox with paddle shifters. The diesel engine on the other hand is available with a 6-speed manual only. Power in both engines is sent to the front wheels. The Toyota Corolla Altis is available in 6 variants. Diesel variants are limited to only two whereas the petrol engine is available with 4 variants. The petrol engine is available in G, GL and VL trims while the diesel gets the G and GL trims only. The G petrol trim can also be had with a CVT and a manual gearbox whereas the GL is available with a manual gearbox only. The Bi-beam LED lamps along with the 10-way adjustable driver’ seat are reserved for variants above the G trim. The 7.0-inch touchscreen system, climate control, ABS with EBD and LED DRLs are standard across the board. The petrol variants get five airbags as standard while the diesel variants make do with three. The curtain airbags however are reserved for the VL variant only. Hyundai Elantra: Hyundai’s D segment sedan scores major points with the buyers when it comes to convenience features. Combine that with frugal engines and a supple ride and you get a package that is tough to beat. Skoda Octavia: A rare blend of comfort, luxury and driving dynamics, the Skoda Octavia is a force to reckon with and enjoys an almost cult-like following in India. Its perception of poor after-sales service however tends to work against it. The Toyota Corolla can be attributed with kickstarting the D segment in India. Even after almost two decades, it remains the car to beat in the segment. It still sticks to its guns of frugality, comfort and a softer ride compared to its competition. Cars coming to the 2014 Indian Auto Expo: In Pictures! Toyota’s ever-so-dependable sedan is trading some of its (boring) sophistication for aggression! It is best, very reliable , low maintenance, very comfortable, Toyota's service is also very good. After all it's world's largest selling car. Confused about Toyota Corolla Altis?